I have been told that I have been an inspiration to the children at school and to other people in general. This has always been interesting to me because I feel that these people and the children inspire me to create art and images instead of the other way around. A prime example is when I drew the staff at my school as cartoon characters. It started one year around Christmas when we have our Christmas concert and staff dinner. Always after the concert, we go out for dinner and we exchange gifts, such as a Chris Kringle. I wanted to liven things up and instead of giving Christmas cards, I decided to create my own with the staff members as a caricature. This was the year I went to New York and saw my Beloved Yankees play at Yankee Stadium and then I made a side trip to Cooperstown, NY to visit the Baseball Hall of Fame. To say that this trip inspired the caricatures this year would be stating the obvious. The staff members were expecting something along the lines of the previous years caricatures but were still surprised by the finished product. The staff loved the cards and caricatures and in the next few weeks I will be posting a few of the characters from the cards because these people inspired me to create these characters. Hopefully they can inspire others. The first caricature is a staff member that was new to the school. She had long blonde hair and I wanted to exaggerate this. From my previous experience I learned that you could never make the caricature too thin. Therefore I made all the characters thin. But the other area I exaggerated were the breasts in this series of caricatures. You will see that all the women had large breasts. Once I presented the cards to the staff with the images they all noticed the thin waists and larger breasts even though many did not have large breasts. They all enjoyed the caricature of the staff member, as did she. I hope you enjoy the first caricature of the left fielder from “In A League of Their Own”. The second caricature is a staff member that I have known since I started at the school. We have had our differences on occasions but we have always worked things out in the end. As with the other caricature I exaggerated the breasts for this series and for the staff member. I her drew in this pose because I wanted to emphases the fact that she had no idea of how to play baseball. This would be the second year that I introduced a softball and t-ball league in the school and she was one of many of the staff that had no idea how the game is played. I wanted her pose to say, “What do I do with this ball?” Hopefully I got it right. Well she enjoyed the caricature but she said I got her hair a little too lite, but everyone liked it anyway. 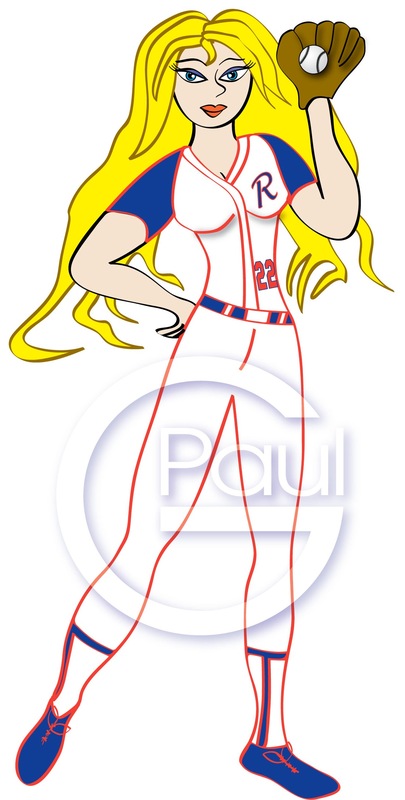 I hope you enjoy the next caricature, ‘Centre Fielder’ from “In A League of Their Own”. The next caricature is a staff member I have also known since I started at the school. She is the supervisor but she also encouraged me to run the baseball program for the children at the school. She too has no idea about how baseball is played and she has no desire to learn, but she knows the children enjoy it so she will stay in right field cheering on the teams. That is why I drew he just standing there waiting and enjoying the view. Well she enjoyed but especially the fact that I drew her with large breasts. A shared sentiment for all the staff members. I hope you enjoy the next caricature, ‘Right Fielder’ from “In A League of Their Own”. The next caricature is a staff member I have also known since I started at the school. She is the Director or boss. If you saw the previous years staff drawings was the one drawn as Miranda Priestly. She also made a comment that she was not think enough and she wanted to me drawn thin like this one staff member. Well this year I made it a point to draw her thin and with large breasts and man did she notice. She was one of the first to comment on the larger breasts, however she was very pleased with the caricature. I hope you enjoy the next caricature, ‘Designated Hitter’ from “In A League of Their Own”. The next caricature is a staff member I have known and worked with for many years and this year I had the extra pleasure of having her as my Chris Kringle. She is a good friend and was always there to help and support me both at work and after hours. I took extra time to create her caricature, which I usually do with my Chris Kringle. I took extra care to draw her face and it so happens that her body type was very similar to the drawing. In some ways it is not a caricature but an accurate cartoon of her. The fact that she was the first drawing I created for this year’s caricatures, I had to create the uniform using her as a model. The uniform was something I came up with that was similar to a uniform I wore when I played baseball. Also the logo “R”, was representative of the final team name. The series logo at the top of the post and for the series ‘Staff Cartoons’ is the final product logo for the team, “The Rockets.” I was also hoping that I could use this logo for the school but they had one already. Well she was surprised and overwhelmed by the caricature as was the entire staff. She even commented that it actually looks like her. I hope you enjoy the next caricature, ‘First Baseman” from “In A League of Their Own”. The next caricature is a staff member I have only known and worked with for a few years but was a good friend non-the-less. Sometimes being the only male at a place can be a little lonely, but having another guy helps. There are people how I work with and others I consider a friend, this person was both. When drawing this caricature, for obvious reasons, I could not draw him like the others. But I wanted to show his youth but not make it too masculine. The uniform was the same like the women’s, yet I had differences with the shirt. In drawing a female I would use a figure 8 for the body and made the legs curvy. Yet with a male caricature I made the shoulders larger and had a square stomach and waist. The face was another major differences especially the eyes. With the women I used oval eyes that came to a point on either end of the eye, however with a male I made them more oval and without eyelashes. The eyebrows were also larger and the mouth was a simple line without lips. In the end I created him very youthful and he looked like a regular baseball player. He enjoyed the caricature very much and even though he was more into soccer. He said I made him look like a really ball player. I hope you enjoy the next caricature, ‘Second Baseman” from “In A League of Their Own”. The next caricature is a staff member I have only known and worked with for many years. She was my room partner but also a good sounding board when I have any ideas. Her and I would sometimes rub each other the wrong way but we always worked it out. That little abrasiveness was something I enjoyed and I wanted to bring out in her caricature. I made her stance more of a “here I am, so what are you going to do with it.” In drawing her I would use a figure 8 for the body and made the legs curvy. Yet like the others I really emphasized the breast and her small curvy waist. She is naturally thin and I wanted to over emphasize it. Over all she really enjoyed the caricature and so did the rest of the staff. Some even wanted me to draw them with this thin curvy figure too. I told them I did its just that this person looks very much like her caricature. I hope you enjoy the caricature of the, ‘Third Baseman” from “In A League of Their Own”. The next caricature is a staff member I have only known and worked with for many years. She has been a trusted friend and great co-worker. No matter what happens I know that this person has my back and she know I have hers. I started this caricature with the figure 8 as usual but I also wanted to show her a bit more athletic. She is very athletic and being a mom you have to be. The biggest issue I had been you hair and getting it just right. She has different hairstyles and to get one that suits her personality was a bit trying. Therefore I settled for her wearing a baseball cap backwards and have curly hair along the sides. She loved the caricature and like the rest of the women, she enjoyed the larger breasts. However she did comment on the bigger arms and I told her I wanted to make her more athletic because she is. She enjoyed that extra touch, as did the other staff. I hope you enjoy the caricature of the, ‘Short Stop” from “In A League of Their Own”. The next caricature is a staff member I have only known a few years. Yet I consider he a good friend and a person I could talk to about anything. Her advice, during some difficult times, has been invaluable and truly helpful. She is naturally taller than I am and I knew that I had to make her the back catcher of the team. 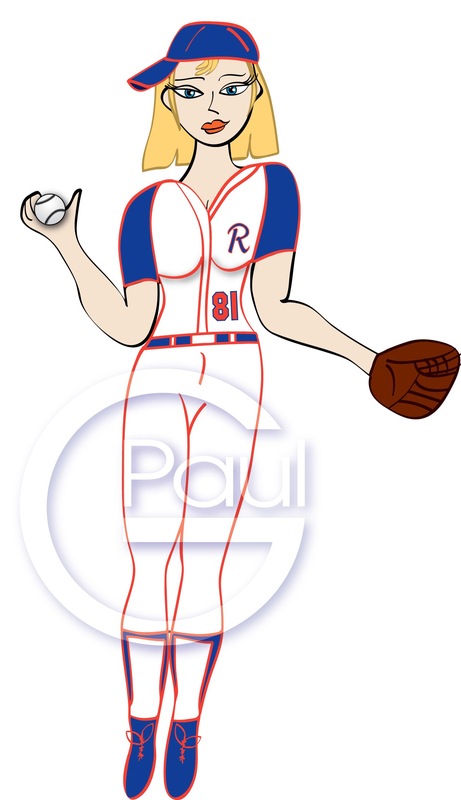 The inspiration for her caricature came from the movie A League of Their Own star Geena Davis. In the movie her character is the back catcher for a team in an all woman baseball league. She is a strong woman who sacrifices a lot for the good of the team, which is no different from the staff member. I made her taller than the rest of the staff because she is, but I really took some time to make the chest protector and shin guards look like what they used in the 50’s and 60’s. I still created her in the figure 8 shape but with the extra protective gear and the black marks under her eyes are what really made her look like a real back catcher. She loved the caricature but she mentioned that I did not draw her breasts like the others. I told her that with the protect gear you could not see them but I told her, “Trust me they are there.” She had a good laugh and everyone loved the caricature. I hope you enjoy the caricature of the, ‘Back Catcher’ from “In A League of Their Own”. The next and last caricature, if you haven’t guessed, is yours truly. Out of the entire staff I am the only person who actually understands baseball. Therefore it is natural that I would make myself the pitcher of the team. Most of the time it is the back catcher that directs things on the field but the pitcher also does it. I created a figure similar to the other male caricature but I wanted to make him look a lot different. I have broader shoulders and a bigger chest I wish my waist was the size I drew it but eventually I did achieve that goal. I made the caricature more athletic than the others. As with the other male caricature, I did not use the figure 8 for the body shape, but more of a wider chest based on a trapezoid shape and a square mid section. The arms and legs were more muscular than the others. The major differences are the eyes and facial hair. Instead of the oval eyes I used the outline of the glasses. Of the entire staff I am the only one with eyeglasses so I used it in the caricature. The other difference is the facial hair. At the time I hade none but there are times when I would have a day or two growth on my face. So I just shaded in the area of the beard. With the other male figure, I drew him more youthful looking; yet with my caricature I wanted to show a more mature character. The glasses and scruff accomplished that. When I presented the staff their Christmas cards, they only had their own caricature and to be honest there was no need for me to draw myself. However I also drew a final group picture with all the staff caricatures, so I had to include myself. Next week I will show you the final product. I hope you enjoy the caricature of the, ‘Pitcher’ from “In A League of Their Own”. When I presented the caricatures to the staff as their Christmas cards they all loved their own. Yet I wanted them to have an extra picture of the entire staff. With the previous year, I simply placed the caricatures together as a group but this year I wanted to create a team picture as it were. I wanted something that you that might look like a team photo in a stadium. Placing them together was fairly simple; I just had to make sure I got the heights of the people just right. After I placed a crowd in the background, in the bleachers. The difficult part was creating a team logo. I have some experience in creating logos with my graphic design background but it is a time-consuming process. I came up with the Rockets idea because our school’s name begins with the letter R. I thought of a rocket going around a ringed planet like Saturn and then added a rocket blasting around it. I designed the rocket in the style from the early science fiction books of the 1950s. You can have a better look at, I used it as the logo for the Staff Cartoons section of the blog. 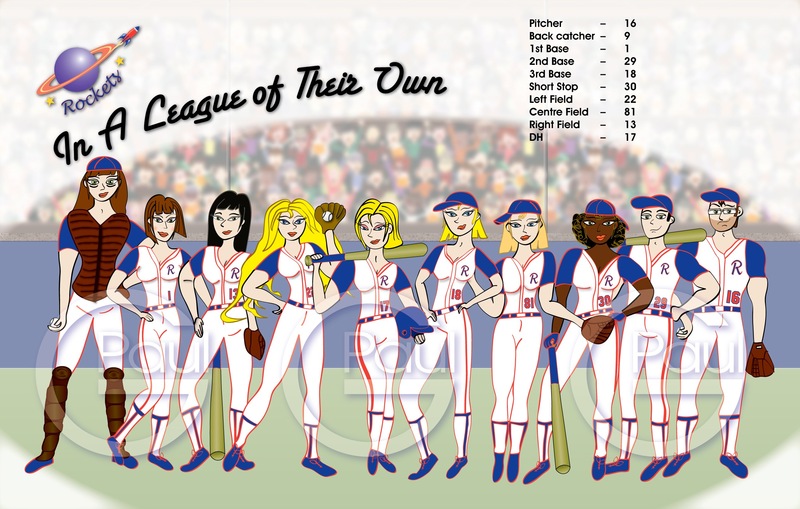 I finally needed a name for the piece and the first thing that came to mind was the movie, A League of Their Ownwhere they retold the true story of a baseball league with only women in the 1940’s. So I used a parity calling the final piece, In A League of Their Own. Well they where all happy with the caricature of themselves and the card, but this was what brought it over the top. They all loved it and to be honest, I had fun creating it. I have a copy framed and hanging in my home and I smile every time I walk by it. I hope you enjoy the final version and the journey it took to create, “In A League of Their Own”.